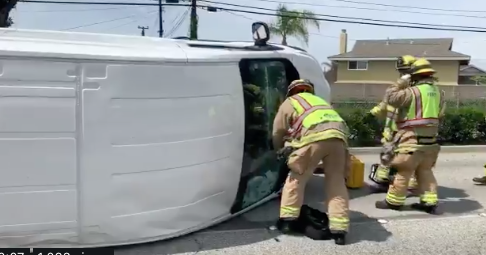 HUNTINGTON BEACH firefighters cut open the roof of a flipped vehicle in the intersection of Hell and Edwards (HBFD photo). 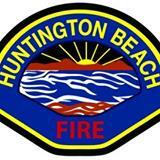 A person trapped in a vehicle after a three-car collision Wednesday in Huntington Beach was safety extricated by firefighters. The crash occurred around 12:27 p.m. in the intersection of Edwards Street and Heil Avenue. One of the vehicles was knocked on its right side, but Huntington Beach firefighters were able to cut the windshield off of the automobile and the trapped person was able to climb free without further assistance. Traffic at the intersection was closed for period.